Applying workplace ergonomics through a continuous improvement process is essential for enterprise sustainability. A good ergonomics process plays a key role in unlocking new areas for improvement. 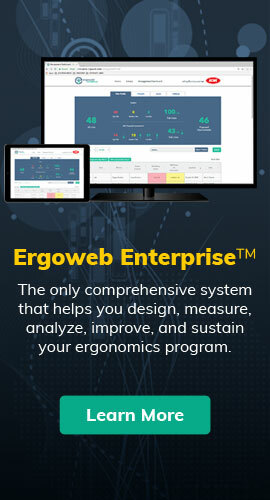 By improving employees’ ability to perform at their best in your systems, ergonomics is uniquely suited to deliver high impact, low cost benefits. Workplace ergonomics is often recognized as a means to minimize the costs and consequences of work-related ergonomics injuries (or musculoskeletal disorders – MSDs). It’s necessary and effective in that process, but a strategic approach that broadens the scope and impact of your ergonomics program brings significant production improvements and returns well beyond reducing injuries. An effective ergonomics process should inherently reduce risk and also improve multiple key performance indicators (KPIs). Companies that seek to improve performance must include ergonomics engineering in their business processes. All the best design and build efforts go to waste if the opportunities and constraints of the human interactions in the system are neglected. If we wait, it quickly becomes too late, and the blame games begin. If we recognize and optimize the human role in process and facilities design, we’re more likely to do things right the first time, reducing costs, improving production outcomes, and moving closer to the perfection sustainable enterprises seek. Workplace ergonomics is not an optional pursuit; it’s a requirement for any sustainable enterprise.